I have lived here almost a year now. August 4th marks the anniversary. 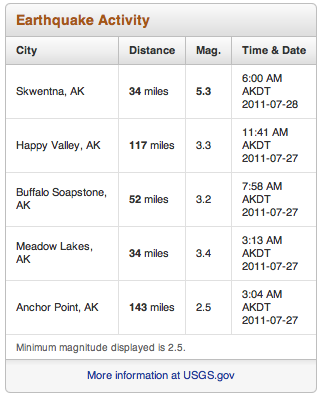 I can honestly say that I have never felt an earthquake until this morning at exactly 6:00 am. The 5.3 magnitude quake shook the house enough to wake me up from a dead sleep and spook the dogs enough that Raegan let out a woof. There was no damage (thankfully) but it only makes you wonder, what would happen if the ‘big one’ hit? The 1964 Alaska earthquake, also known as the Great Alaskan Earthquake, the Portage Earthquake and the Good Friday Earthquake, was a megathrust earthquake that began at 5:36 P.M. AST on Good Friday, March 27, 1964. Across south-central Alaska, ground fissures, collapsing buildings, and tsunamis resulting from the earthquake caused about 131 deaths. Lasting nearly four minutes, it was the most powerful recorded earthquake in US and North American history, and the second most powerful ever measured by seismograph. It had a magnitude of 9.2, at the time making it the second largest earthquake in recorded history. The powerful earthquake produced earthquake liquefaction in the region. Ground fissures and failures caused major structural damage in several communities, much damage to property and several landslides. Anchorage sustained great destruction or damage to many inadequately engineered houses, buildings, and infrastructure (paved streets, sidewalks, water and sewer mains, electrical systems, and other man-made equipment), particularly in the several landslide zones along Knik Arm. Two hundred miles southwest, some areas near Kodiak were permanently raised by 30 feet (9.1 m). Southeast of Anchorage, areas around the head of Turnagain Arm near Girdwood and Portage dropped as much as 8 feet (2.4 m), requiring reconstruction and fill to raise the Seward Highway above the new high tide mark. In Prince William Sound, Port Valdez suffered a massive underwater landslide, resulting in the deaths of 30 people between the collapse of the Valdez city harbor and docks, and inside the ship that was docked there at the time. Nearby, a 27-foot (8.2 m) tsunami destroyed the village of Chenega, killing 23 of the 68 people who lived there; survivors out-ran the wave, climbing to high ground. Post-quake tsunamis severely affected Whittier, Seward, Kodiak, and other Alaskan communities, as well as people and property in British Columbia, Oregon, and California. Tsunamis also caused damage in Hawaii and Japan. Evidence of motion directly related to the earthquake was reported from all over the earth. While the epicenter of today’s earthquake was 34 miles away in the Iditarord checkpoint of Skwentna, I could still feel a pretty good shake in Willow. It makes you wonder with all this…some call it ‘inadequate construction’, I call it Alaskan construction…what WOULD happen if another 9.2 magnitude quake rocked the Mat-Su Valley. In my time here I have seen more houses held together with what appears to be duct tape than anywhere else I have lived in my life. I guess that the freedom of living in Alaska. The ability to stake you claim and build a place with no worries of ‘the man’ looking over your shoulder and mini Nazi government HOAs breathing down your neck. Mind you, not every home is like this in the Last Frontier, but a great deal of them from my observations, especially as you get further away from the booming metropolis of Anchorage. I guess my point to all this is what would all these folks do with their sled dogs if this happened again? We are in the mushing capital of the world right? Well by the looks of things we are in the earthquake capital of North America too. My question to you is: what emergency plan do you have in place for your pets?